I was inspired by … the grace and beauty of the Clumber Spaniel breed doing what they were developed for, even show bred stock retain some smattering of this talent. 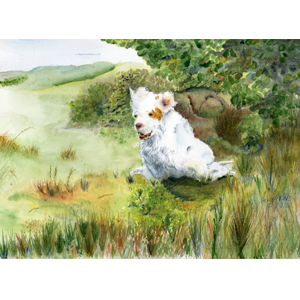 THE STORY BEHIND THIS PAINTING: I was inspired by … the grace and beauty of the Clumber Spaniel breed doing what they were developed for, even show bred stock retain some smattering of this talent. This is a painting based on one of my own essentially show bred dogs. I adore the ability of a dog that is bred with conformation in mind that has a powerful hindquarter that can lift his whole body onto the hindquarter and easily jump over obstacles. This type of ability was essential in the breed’s ancestral home of Clumber Park, and the structure is still demanded in the breed standard, whether judges and breeders choose to read that section or not.